One of the great things about living in New York City is that you have access to some of the best restaurants in the world. 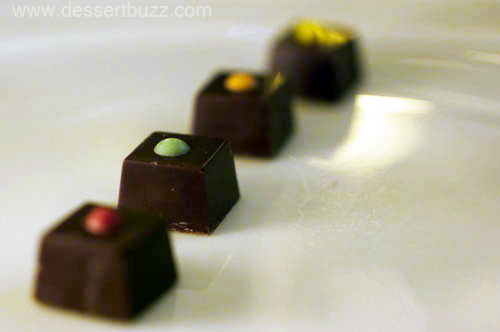 In the last two weeks I had the pleasure of sampling desserts from two, three-Michelin-starred restaurants. 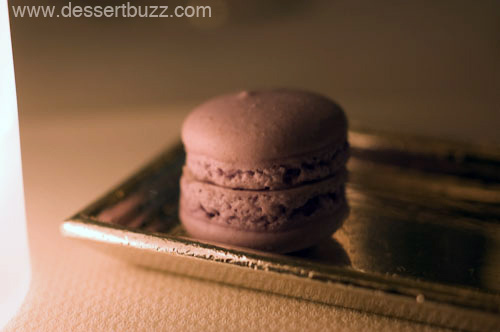 And no, I didn’t just win the lottery, I went to Le Bernardin for lunch and a then took advantage of Daniel’s awesome new dessert and drink offer. 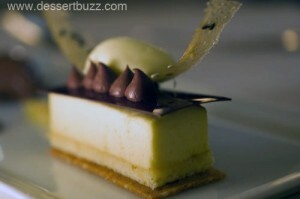 For $25 you get a plated dessert from executive pastry chef Dominique Ansel, a specialty cocktail, fresh baked madeleines and after dinner chocolates. There are some minor restrictions (arrive after 9:30 and only Monday-Thursday) but keep in mind–you are getting the same service, desserts, cocktails and chocolates as the people sitting in the next dining room dropping $200+ a head. It’s hard to say which half of the dessert menu we preferred, it’s split into two parts: chocolate-based desserts and fruit-centric options. Usually, this would be no contest as chocolate would win hands down but both Mrs. Dessertbuzz and I enjoyed our selections from the “fruit” side immensely. 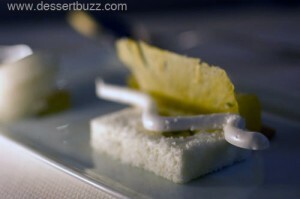 Especially the lemongrass poached pineapple served with incredibly flavorful pina colada sorbet. All the desserts we ate seemed to have flavors that were not only unique (candied buddha hand!) but also very powerful (lemon sorbet) or very mild (olive oil biscuit) depending on what was needed to compliment the rest of the dish. This was especially true with the sorbets. The sorbet’s that came with our fruit desserts, the lemon from the thyme marinated grapefruit and the pina colada from the lemongrass poached pineapple were absolutely brilliant. 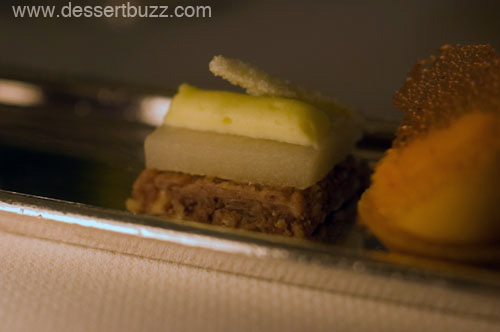 The flavors seemed even more distilled than real fruit pulp. The coconut meringue looks like just a decorative garnish but you could really taste the coconut flavor plus it added nice texture to the dish. My favorite dessert of the evening, the warm guanaja chocolate coulant, might have been the simplest when compared to the others. 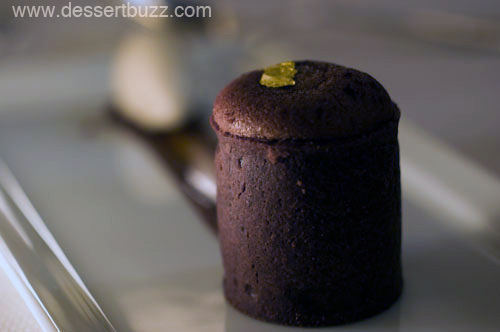 The dark chocolate coulant was like a crispy-edged-souffle and the liquid caramel center was coupled with just the right amount of fleur de sel. Not much more to say other than that this dessert made my night. Mrs. Dessertbuzz, on the other hand, preferred the lemongrass poached pineapple. Dominique Ansel obviously has serious skills and all his plates looked quite beautiful. Choosing one or two (I recommend even more) is a matter of what you are in the mood for on a given night. You can always ask Daniel’s superb staff if you need some directions. On our visit last week, Pascal provided expert guidance with an encyclopedic knowledge of each dish. 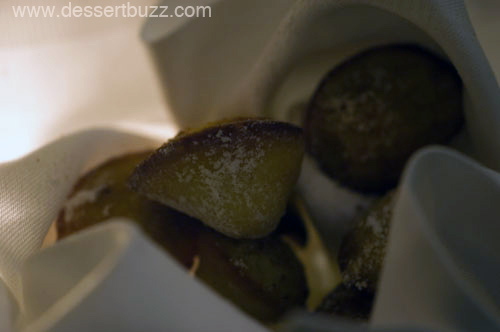 Don’t forget that at some point towards the end of the evening you will be brought a piping hot basket of madeleines which taste as good as they smell. If, like most people, you have only ever had madeleines that have been sitting in a bakery for a few hours, get ready to experience a completely different madeleine. For people who understand the word “value” this is quite possibly the best high-end foodie deal to come along in a while. 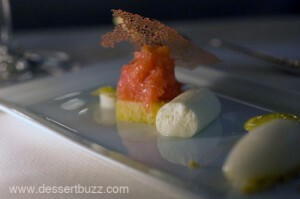 Here’s a great article about Dominque Ansel along with an interview from the Chef’s Connection. Details on the $25 deal are here. Daniel is located at 60 East 65th Street. Wow! That looks pretty damned good. @FN – Yes. You definitely could see and taste the years of experience with these desserts. No way you could just go home and make these desserts for company. Dessertbuzz » Blog Archive » Dominique Ansel Bakery Update: New Frenchy French items added!